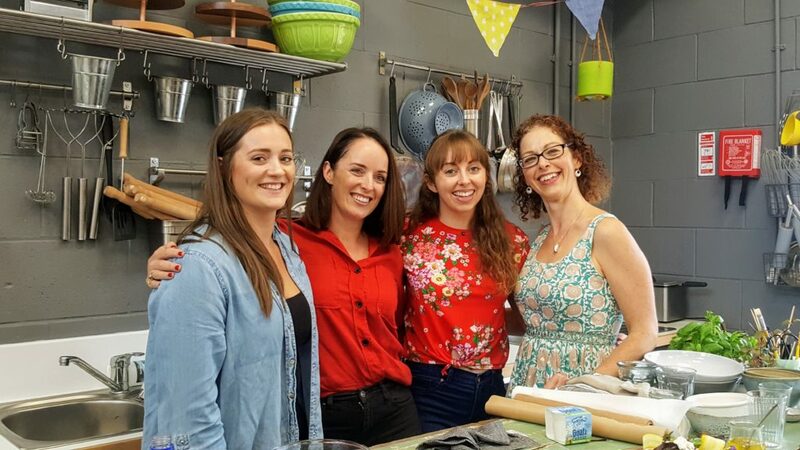 On 8 September 2011, I was at an Irish Food Bloggers Association food photography / styling and recipe writing workshop that was being presented by Donal Skehan, Sharon Hearne-Smith and Kristin Jensen. I went with a large bump; it was the Small Girl’s due date (she was always going to be tardy! ), but it was worth driving the two-and-a-half hours to Bord Bia in Dublin to spend time with my tribe, to catch up with old friends and meet new faces. Since then, the crew that gathered for that workshop have gone on to write books and newspaper columns, open Mexican food shops, run pig rearing courses, start their own cookery schools, become the chair of the Irish Food Writers’ Guild and many other food–related things besides. 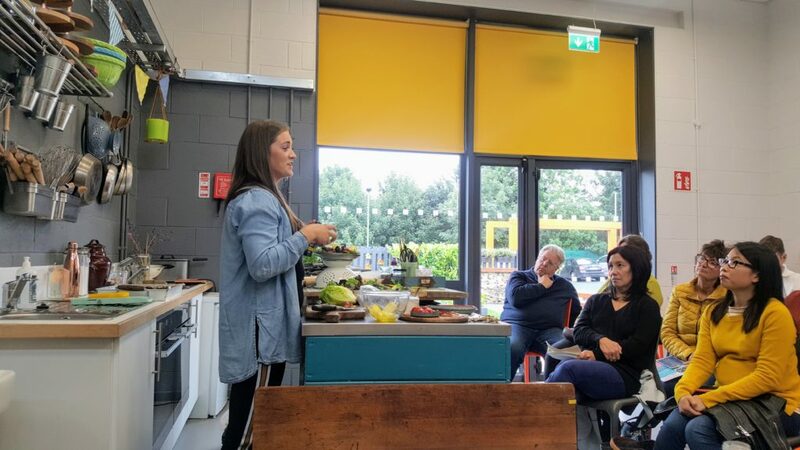 Last Saturday, exactly seven years later, I was on the panel for a food photography and styling workshop at GROW HQ, the Waterford base of GIY Ireland. Also on the panel were Sinéad Delahunty of Delalicious, Frances Walsh from The Honest Project and Sarah-Kim Watchorn, three ladies that I hadn’t met in real life – although I had encountered them on their gorgeous Instagram feeds. Together we had a good balance of experience and passion, practicality and organisation; like that 2011 workshop, I left with my head buzzing with ideas from their talks, notebook pages full of tips and having had the pleasure of meeting an audience of engaged bloggers and Instagrammers and food photographers. Looking seven years in the future, who knows where this group will end up. I’m looking forward to finding out. Because I thought we needed a veggie/sugar-rush during the talk – and because I was in GIY territory! 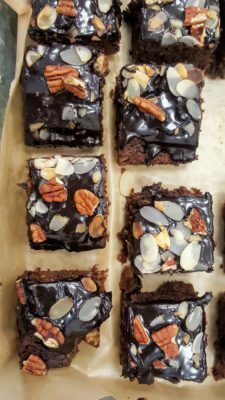 – I made this deliciously moist cake to share. My courgettes didn’t behave this summer but I have a cousin up the road who keeps me well supplied. This cake goes down very well with kids. Just leave out the nuts, don’t mention the courgette word and let them put lots of sprinkles on top. I’ve always ended up using grated marrow for this, as the “courgettes” that I’m given tend to be the ones that got away! The grater reduces them to their constituent parts, however, and I just discard any tough pieces of skin. If there is a lot of liquid when you have grated the courgette / marrow, just tip it away. While you can use a chocolate ganache on top of the cake, I love the finish of the glaze below. If you don’t have a bottle of Eight Degrees Barleywine lying around (there’s a lot of beer in my house! ), substitute with stout, porter – or extra cream. Cuts into 15 squares. Preheat the oven to 180C / 160C fanbake. Butter and line a deep 25cm x 38cm swiss roll tin or roasting tin with greaseproof paper. Sift the flour, cocoa and cinnamon into a medium bowl. In a large bowl, thoroughly mix the oil, sugar, courgette, eggs and vanilla. Tip the dry ingredients on top and mix gently, until just combined, finally adding the walnuts. Bake for 20-25 minutes or until a skewer inserted into the middle of the cake comes out clean. The length of time that the cake takes to cook depends on how moist the courgette is. Cool on a wire rack. For the glaze, melt the butter in a heavy based saucepan over a medium heat. Add the sugar, cocoa, cream and barleywine and continue to stir until the mixture is smooth. Stir in the salt. Leave it to cool and thicken slightly, then pour over the cake. Sprinkle with toasted nuts and allow to set before cutting into 15 large squares. Adapted from a BBC Good Food recipe. Here’s the original list – put together by Adam from The Purple Pantry / Cook It Yourself Food Blog – of bloggers who came along to the event in 2011. There may be some broken links. Wow! Seven years! In one way it seems like yesterday, and yet, it also feels like eons ago! I remember bringing sausage rolls to that event…. they didn’t last long! I remember those oh-so-delicious sausage rolls, Margaret! They certainly didn’t stick around. I was so glad to be able to make that workshop, bump and all. The learning is one thing, but it’s the people that you meet at these events that makes it all worth while.